Independent Sen. Bernie Sanders has said he will seek re-election to another term in the Senate as an independent in 2018. But he has not disclosed if he will run for president in 2020. Nearly three years before the 2020 election, the latest Morning Consult/Politico poll suggests America’s most popular senator, Vermont’s Bernie Sanders, could beat President Donald Trump. The survey of 2,586 registered voters, conducted Nov. 16-19, has Sanders currently leading Trump 42 percent to 36 percent in a hypothetical head-to-head. That is a supportive nod to the independent who unsuccessfully fought Hillary Clinton for the Democratic Party’s presidential nomination in 2016. “That says a lot about the firepower he can bear,” said Nina Turner, former Ohio state senator and the current president of pro-Sanders political group Our Revolution. 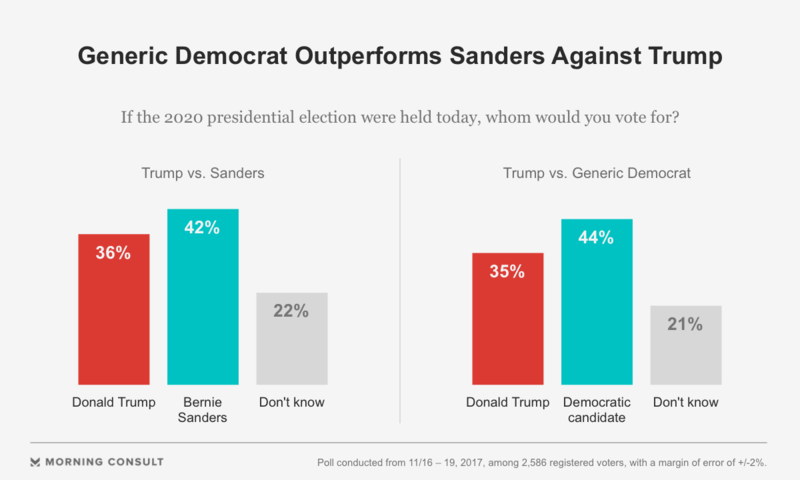 Sanders’ lead over Trump in the hypothetical matchup is smaller than the 9-point advantage of a generic Democratic candidate, who led the president 44 percent to 35 percent, according to the survey. Among Democrats, the generic party member did 11 points better than Sanders, leading Trump 81 percent to 7 percent. Seven in 10 Democrats said they would support Sanders, while 9 percent said they would support Trump. “The closer we get to knowing who is going to run, I think that generic factor goes away,” Turner said in an interview Tuesday. Sanders has said he will seek re-election to another term in the Senate as an independent in 2018, but has not disclosed if he will run for president in 2020. His spokesman would not comment on the 2020 race. A Morning Consult/Politico survey released last week found former Vice President Joe Biden leading Trump 46 percent to 35 percent. The 11-point spread is 5 percentage points better than Sanders’ hypothetical margin. Biden also did better than Sanders among Democrats, with 78 percent saying they would vote for the former vice president. That survey, conducted Nov. 9-11, was more favorable to Democrats in terms of Trump’s approval rating and the generic presidential ballot. Gregg Keller, a Republican strategist and former executive director of the American Conservative Union, said the two surveys show a difficult primary election landscape for national Democrats looking for a nominee to challenge Trump in 2020. “Like the last one, it will pit their traditional liberal wing against a nascent, highly-energized and self-proclaimed socialist one,” he said in an email on Tuesday. While both Sanders and Biden held their own against Trump in the Northeast, Midwest and West in a hypothetical matchup, Sanders underperformed Biden in the South — a region where Clinton won more primaries and caucuses than Sanders in 2016. According to the most recent poll, Trump led Sanders by 5 points, 40 percent to 35 percent, in the region, while Biden led Trump 43 percent to 37 percent in the previous poll. Kentucky’s former state auditor, Democrat Adam Edelen, said Southern Democratic voters are looking for authentic candidates who communicate a message of “economic security.” He is leading an effort called “New Kentucky Project” to re-engage Democrats in the Bluegrass State. He pointed to Biden and suggested other 2020 Democratic possibilities, such as New York Sen. Kirsten Gillibrand or Ohio Rep. Tim Ryan, who unsuccessfully challenged House Minority Leader Nancy Pelosi for the House party leadership role after the 2016 elections. “A good candidate who understands the pain and has felt economic insecurity – that’s what people are looking for,” Edelen said Tuesday. In the South, Trump has a 2-point net approval rating: Forty-eight percent of Southern voters approve of him while 46 percent disapprove, according to the recent survey. Nationally, however, Trump’s approval is 6 points underwater, with 44 percent of voters approving and 50 percent of voters disapproving.